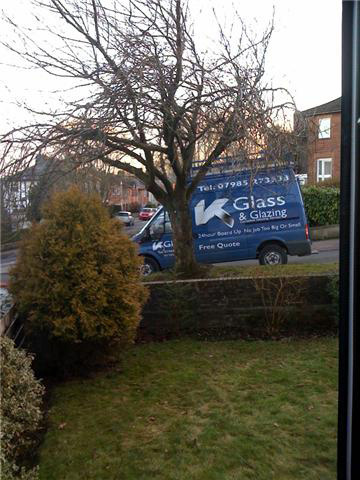 Here at K Glass & Glazing we are perhaps best known in the field for replacing misted up and broken down Double Glazed units. You may be wondering what to do with that unsightly unit that you can no longer see through as the condensation inside is so bad. You my think that you have to replace the whole window which would cost quite a lot of money. Did you know that all you have to do is to replace the glass unit itself and did you also know that it is not as costly as you may think. Contact us and we can tell you very quickly how much it will actually cost you. 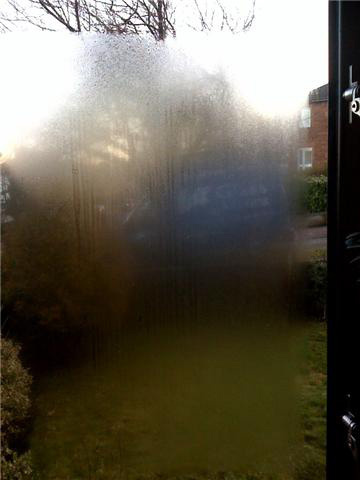 What is a Broken Down or Misted Up Double Glazed Unit? A Double Glazed Unit consists of two panes of glass with a void in the middle, all packaged as one single unit. Misting up of a unit is essentially where condensation creeps into the void in the middle causing an unsightly appearance. This worsens over time until you can no longer see through it clearly (as seen in photo). It becomes extremely apparent when the sun shines on it, just as it is painfully obvious that your windows are dirty when the sun shines directly on them. The main reason why a double-glazed sealed unit can mist up (or ‘break down’ as it is referred to in the trade) is due to premature failure of the perimeter seal, which is obviously dependent on how the sealed unit was originally made. Also, another reason for a double glazed unit misting up is dependant on how the framework it is fitted into was made or how the double-glazed sealed unit was fitted into the framework. Additionally, severe weather conditions such as wind and rain as well as some cleaning chemicals can have an effect on the Double Glazed unit over time. What actually happens is the perimeter edge of the unit loses its integrity and lets in moisture somewhere. Initially it may only be visible when the sun shines directly on it and heats the moisture within drawing it upwards and thus appearing as condensation. It will however worsen over time until the unit is described as being totally broken down. The only simple and cost effective answer is to replace the double-glazed sealed units with new ones. We are not talking about replacing the window frames themselves, just the glass (the Double glazing). There will be no alteration to the existing framework. It is useless trying to separate the 2 glass panes to then remove the condensation, as the sealed unit is factory made with the panes bonded together to last a lifetime.